Top 10 Fav. Digital Texts! 10 More Digital Texts That Teach! When Sonja and I first began writing our new book, Flip Your Writing Workshop: A Blended Learning Approach, we kept referring to it as our “Flipping Without Flipping Out” project. We believe in fostering a balanced blended learning approach in our classrooms, but when we first began flipping lessons, we had some moments of panic. However, instead of flipping out, we supported each other and embarked on this journey together. This Thursday our new book will be released. Many of you, who know us and have read our blog before, know that we love talking about our passion for digital texts and teaching our students to think critically and interpret texts through multiple lenses. We also love talking about our favorite ways to inspire our students to read and write and the challenges we’ve faced in our classrooms. This week, we will chronicle our journey with flipped learning in our writing workshops. We will take you through the good, the bad, and the ugly so that you can see what we’ve been working on and what it’s really like. Sonja and I get together on Saturday or Sunday morning at our favorite Panera Bread Restaurant in New York. We sit at our favorite table (the one near the electrical outlets) and begin typing away. We also chat about our classrooms and what we’re working on. Oftentimes, our conversations turn to the strategies we’re using in our rooms to help our students grow as readers and writers. “I’ve found this great digital text,” I might say to Sonja. And she might respond, “That’s perfect for a chart I’ve been thinking about.” We love our discussions about the ebb and flow in our workshops. We also talk about how we’re constantly trying to meet the needs of all our learners. How can we best differentiate our lessons? A few years ago, we began talking about the different ways we could use the technology in our classrooms to help differentiate our curriculum. Flipping lessons seemed like a great way to help our students review material as well as move forward at their own pace. We never set out to create flipped lessons for homework. We wanted to flip lessons in order to differentiate. We wanted to create lessons that our students could access at home and at school that would move them forward at their own pace. Example #1:It can be hard to learn a new writing strategy as quickly as everyone else sometimes. Occasionally, students need more time to let concepts sink in. We all wish we could hit rewind sometimes! Students who need more time developing an important skill will love flipped lessons. With a few flipped lessons at the ready, students can learn from them as many times as they need. They can work at their own pace. Example #2: Say you have a student who is new to your school and is already familiar with persuasive essay writing. This happens each year in our classrooms. With a few flipped lessons about some advanced strategies for writing a persuasive essay, this student can move forward independently. Individualized learning is just one way that we’ve used flipped learning inside and outside the writing workshop. Tomorrow we’ll talk about the second reason we turned to flipped learning in our blended learning writing workshops. Do you receive book recommendations from Amazon.com? I am on their mailing list, and I enjoy reading which books they are selling to their teacher club members. Over the weekend, I read an email about books they recommend for children ages 9-12. I wasn’t surprised to see Minecraft books listed half a dozen times. Amazon is pushing these books because they are the books that many children want to read. Minecraft is HUGE for many of our students right now and we need books that relate to their interests. Why Minecraft? Why do our students like reading these books? Over the summer, I wrote a post for the Nerdy Book Club about Minecraft books in the classroom and their potential to engage readers in the reading workshop. If you’ve ever played Minecraft, then you get it. It’s a sandbox game that has endless possibilities. It is a game that can go on forever. Plus, it incorporates building, problem-solving, and magic. What could be better?! Minecraft can be used in the classroom in many ways. Andrew Miller wrote an article for Edutopia called “Ideas for Using Minecraft in the Classroom.” In addition, this link will take you to a great YouTube video about Minecraft in the classroom. Grab Reluctant Readers’ By Creating an Appealing Display – Fully embrace Minecraft! Your students’ faces will light up when they see a Minecraft display in your classroom. 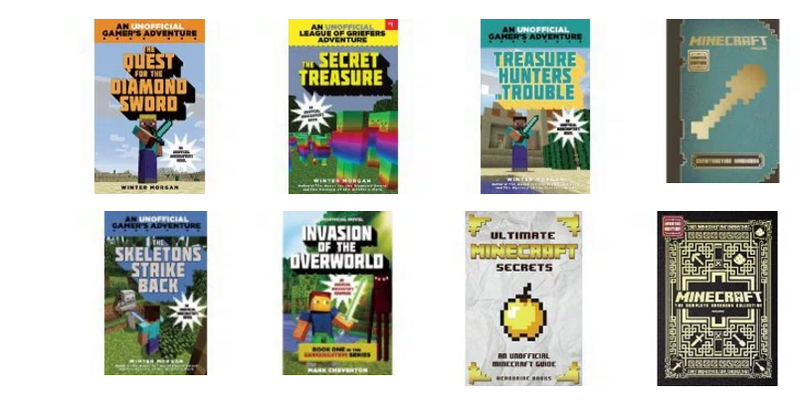 Whenever I put out Minecraft books, they are all gone by the end of the day! These displays are a huge draw for many of my reluctant readers who are fans of Minecraft. Get Some Minecraft Manuals for Minecraft Hacks– This is the first type of Minecraft book that my students ask for. They want to read the tips and tricks for how to play Minecraft. Students quickly move from these tip books to Minecraft novels. How’s it Going? Confer with Students about their Minecraft Reading– Many students who love Minecraft enjoy talking about the characters, the worlds that they are building, and the choices they are making. You can leverage students’ affinities with Minecraft and discuss the main character’s motivations, feelings, and development/change. You can also discuss setting descriptions and how the setting shapes the character’s decisions. Write about Minecraft in Reading Notebooks – Students will love writing in their reading notebooks about their Minecraft reading! All that great reading will lead to some good writing! Getting ready to do some good reading and writing over the holiday break, Dana Johansen spends her time teaching fifth grade in Connecticut, negotiating with her yellow lab about not chewing on the Christmas tree, and playing the app, Cookie Jam. She has taught elementary and middle school for fourteen years. Dana is a doctoral student at Teachers College, Columbia University where she studies blended learning in reading and writing workshop. She is the co-author of the books Teaching Interpretation and Flip Your Writing Workshop. It’s the week before the holiday break and my students are ready to spend time with family and friends. This can be a challenging time for teachers as we try to harness enough energy in our classrooms and maximize our teaching time before we reach the finish line! In a previous post, I discussed the benefits of re-imagining book reports as book trailers and how this work can energize reading workshop. The book report is a reading workshop staple that offers important learning opportunities for students. Book trailers do as well. Many of the same goals we have for our students when we assign book reports can be accomplished through digital literacy. The creation of book trailers helps to broaden our students understanding of literacies from a static, conventional, print-based conception to an appreciation of literacies as a shifting, evolving, and dynamic force. So here’s how I get students started! It’s important to show students a good model of a book trailer. Here’s one I show to my 6th graders on a book they’ve read and loved: The Crazy Man by Pamela Porter. It is a good model of the type of work I hope they’ll do. After viewing it, I asked students to brainstorm some of the essential elements of book trailers that they think should be included in their work. In addition to stating literary elements such as setting, mood, and theme, my students noted that the most important element of a book trailer is to persuade the audience to read the book. Plan! Use a Book Trailer Storyboard Outline to plan the format and order of your trailer. Which parts of the book will you feature? What images will you need to find? Plan! Collect images. Save them as jpeg’s in a Google Folder that can be uploaded later. Production! Use the cover of the book with the title and author. Select images and music that match (not distract from) the story. Speak clearly and at an appropriate pace during voiceovers. Production! Layout first! Once each scene is in place, then experiment with special effects such as music, movement, color, etc. Remember to focus on the purpose of this work. The trailer should persuade the audience to read the book! There is no one right way to make a book trailer. Focus on the goals you have for your specific learners and what you’d like them to be able to demonstrate as readers. As mentioned previously, other important learning opportunities for students include: enjoying the creative process, appreciating each other’s strengths and talents as they work collaboratively with their peers, and discovering how to advocate for their needs by seeking help from teachers and digital sources. So next week, on the last day before our break, we’ll be enjoying the fruits of our labor… with popcorn, of course! I’ll be sure to post an example of my students work. And I look forward to sending my students off with books in hand that they are excited to read! Sonja Cherry-Paul has been an educator for the past 17 years. She is a middle school English teacher and co-author of Teaching Interpretation: Using Text-Based Evidence to Construct Meaning and Flip Your Writing Workshop: A Blended Learning Approach. Sonja is a Jane Addams Children’s Book Awards committee member who is committed to celebrating authors and illustrators who address issues related to social justice. Re-energizing Reading Workshop – We’re several months into the school year now. Our reading workshop routines are in place and my students are looking for a new, fun challenge. Creating book trailers fits the bill and the excitement in the room is palpable. There’s a positive and productive buzz in the room as students focus with great intent on their creations. Of course laying some essential ground rules is key. Students are engaged in the process, and it’s so much fun to watch and listen in on genius at work! Collaboration – We can tell our students to cooperate until we turn purple. But some lessons are best learned by experience. Students truly understand the meaning of collaboration as a result of creating a book trailer. They learn to negotiate power, to listen to ideas different from their own, and that creativity thrives in spaces that are nurturing and positive. Also, they experience the meaning of the Mayan proverb: Many hands make light work! Rereading – Looking for authentic ways for students to revisit a text? Setting specific goals and requirements for their book trailers will help you to accomplish this. Remind students that movie trailers are created from a finished (or mostly finished) product. The creators of these trailers pull from this product to give a sample of detail about characters, setting, and theme that will persuade viewers. These are the literary elements students should think about as well when creating their book trailers. To do this well requires revisiting and rereading key parts of the book to powerfully, accurately , and persuasively portray these elements. Excitement For Books– Looking to get students excited about reading a new book? Book trailers are created by students, for students, about books they love. What better way to get more books into the hands of students? Worried about the Tech? Don’t be! There are several manageable, user-friendly options to choose from. In my next post, I’ll share some Trailer and Tech Tips for helping students make awesome book trailers!